Over the last 25 years Mimicks have painted over 200,000 faces! Mimicks Face Painting was founded in the summer of 1990 by Sherrill Church. Her daughter Ashlea Henson has worked in the business since 1996 and became a partner in 2009. Sherrill Church is the business manager of Mimicks Face Painting that she runs in partnership with her daughter Ashlea Henson. Over the past two decades her primary focus was to build a face painting company like no other, introducing a variety of additional creative make-up lines to compliment the popular face painting service, and traveling the width and breadth of the UK attending some of the largest shows and festivals in the Country. These days Sherrill’s passion is to pass on her extensive knowledge in the industry and as a make-up instructor she again travels far and wide to train like-minded individuals on how to set up a face painting service using the Mimicks module. She started Mimicks Face Painting in 1990 when her children were very young. She would take them to her events whenever she could and Sherrill could see from an early age that Ashlea was very interested to learn her skills and by the time she was only 11 years old she was on the payroll (well sort of) and a very competent face painter indeed. Mimicks Face Painting has been on an upward spiral of success over the years. Over the years the company has grown from strength to strength and has been involved in providing activities such as face painting, glitter tattoos, henna body art and hair braiding at many different locations and celebrations across the whole of the Country. Sherrill and her team of staff were traveling the whole of the Country in their motor home attending shows and festivals for the first 16 years. From April through to September Mimicks could be found in a different field in a different part of the UK providing their services to a diverse range of customers. During these years Sherrill and her husband Roger also had a manufacturing company making the popular novelty toy ‘The Wiggley Worm’ which they sold to market traders and showmen across the UK and on their own face painting trade stall. Sherrill has been in business with a portfolio of companies since the early 1980’s, She’s owned a Bridal shop with her family and then ran a curtain making service for a number of years. Combined with bringing up her two children Ashlea and Asa, she has encountered many experiences including the highs and the lows, the profitable ventures to those that didn’t even get off the starting block – and all those unforgettable missed opportunities! Today, 25 years on, Mimicks primarily attend only corporate events and private parties with their team of freelance painters, and their diary is as full as it ever has been. 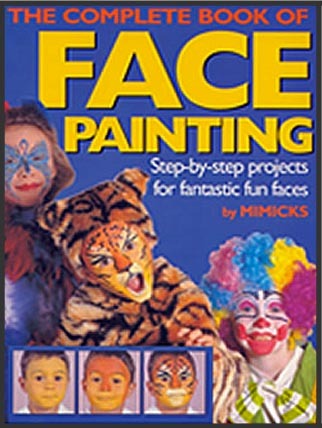 In 1996 Sherrill had her Face Painting book published ‘The Complete Book of Face Painting, by Mimicks’. A few years later it was re-published by an American company as ‘Fantastic Fun Face Painting’. Published by Random House, London and Sterling Press, New York, it sold very well in Europe, the United States and Canada and can still be purchased today through Amazon. Sherrill has recently written a couple of business books which focus on how to start and run a successful face painting venture which includes all the need-to-know information that anyone could possibly want in order to become part of this exciting and rewarding creative make-up industry. Sherrill has worked both part-time and full-time in a number of local colleges between 1996 and 2014 teaching Theatrical and Media Makeup courses and Cosmetic, Fashion and Photographic Make-up courses along with other allied Beauty Therapy courses. It was here that she gained her teaching, assessing and internal verifying qualifications. 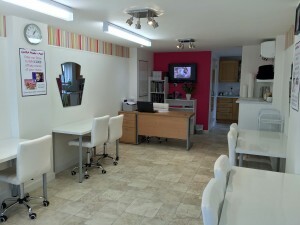 Her area of training become quite extensive as in 2011 she became an instructor for Capital Hair and Beauty and her courses take place across the country from Southampton to Glasgow. She also provides continued professional development (CPD) courses for lecturers in colleges across the UK, teaching them how to deliver the face painting unit by City & Guilds and VTCT in their own colleges. From the early years of training her own Mimicks staff, Sherrill is now at the forefront of training provision for face painting in the UK. Her Beginners course has been attended by over 1000 students, all of which came away with their first insight into the industry and an armoury of practical skills that could be used immediately. The launch of Lipstick, Powder and Paint. Finally, after much planning and preparation, she will be opening her accredited training studio in Holbury, Southampton in September this year. It’s here she’ll be able to run the popular face painting courses and also other creative makeup training along with beauty therapy, nail services and hair styling courses, delivered by some of the best local lecturers and international instructors in the industry. Ashlea Henson is the creative administrator of Mimicks Face Painting. After working in her Mum’s business for 13 years, in January 2009 Sherrill offered her the opportunity to become a partner in the company. She brings with her a fresh new approach and spends countless hours designing new faces for the Mimicks artistes to incorporate in their face painting regime, updating the visual marketing aids, display equipment and sales literature, and also overseeing the quality of workplace standards that Mimicks is so recognisable for. Ashlea was a very young child in 1990 when her Mum started Mimicks and from those very early days she became fascinated with the little round pots of paint that her Mum called water make-up. She was always first in line when the kit came out at practice time, and her friends thought it was wonderful when they came round for tea and left with an artistic creation on their face. Over the years she would attend as many events as possible and would spend her time just watching and learning from the Mimicks girls, taking it all in. Sherrill could see her keen interest so she bought Ashlea a training head block so that she could practice on. Her very first face painting design was a Parrot that she painted on her Mum. By the time she was only 11 years old, and after much persuasion, Sherrill allowed her to work on paying customers and more often than not she was smaller than those she was painting and had to have a custom made box to stand on so that she could reach their faces! Throughout her school years she was most happy in her Art and Craft classes and allowed her natural artistic ability to flourish and develop. On leaving school she progressed through a Fine Art A Level at a local college and then went on to achieve The International Theatrical and Media Makeup Diploma. For a number of years now Ashlea has been producing face painting videos which can be seen on YouTube and has over 30,000 subscribers. She enjoys passing on her immense knowledge surrounding her face painting skills not only through her step-by-step video tutorials but also as the Advanced Face Painting Course instructor.